Queen of the house, a photo by The Bacher Family on Flickr. The cat in this picture is 13 years old. Like many cats of that age, she was winding down a bit: didn't want to go outside as much, didn't run around as much in her family's yard in the eastern United States. So when her human companions got new jobs and moved to San Juan Island in Washington state, they worried that she would have a hard time making the trip. On the contrary: when she arrived at her new home, on five rural acres with clean air and lots of room to run and explore, she felt a bit of her youth return. 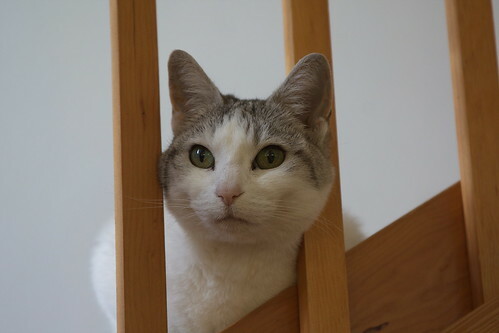 She still carries herself with the dignity of an older feline, but she happily goes outside and explores; she bats and chases toys around with her humans; and she perches alertly in her perch on the staircase to watch over her domain. She is unquestionably queen of the house. Photo of the day: Who needs Speedo?